Anybody who ever had the pleasure of seeing the hilariously bad disaster movie “The Swarm,” which featured clouds of “African killer bees” by the thousands bringing mayhem down upon America in the 1970s, likely had a slight fear of all bees as a result of that movie, once called the “ultimate B-movie” by Razzie Award founder John J.B. Wilson. If such people with pathological fears of bees are to be found in the world, hopefully not too many of them were in Sydney, Australia about three weeks ago, specifically the city’s renown Castlereagh Street. During a relatively quiet Friday afternoon, a reported “cloud” of honey bees spanning three stories high flew in during Castlereagh Street’s lunch rush looking for a place to call home, causing shocked bystanders to run for cover inside any open door they could find. 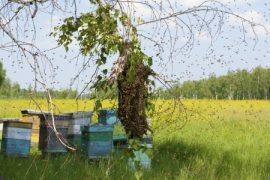 According to witness accounts of the incident, the uprooted swarm buzzed around the buildings for a while before they eventually settled around a motorcycle parked next to the sidewalk, which was where the queen bee had settled, leading to all the worker bees surrounding her protectively. Ricky Lee, who works on Castlereagh Street, stated the insects flew all along the road and were spread out like confetti. “[The cloud] was three stories high. I thought it was a ticker-tape parade. There were people running on the other side of the street, just trying to get out of there as quickly as they can.” Lee also stated that the large swarm was visible over two blocks from the scene. Many onlookers eventually came in to take pictures on their phones once the swarm settled around their queen. Almost as if she were speaking to everyone’s “The Swarm” fears, Brown clarified what swarms are actually like, saying they’re quite passive and basically homeless, looking for a suitable place to start a new hive. 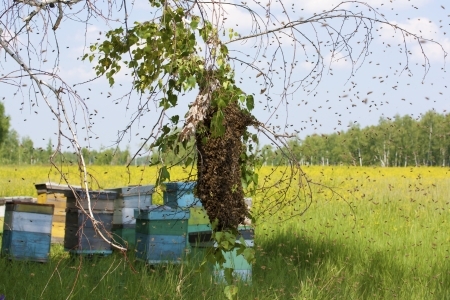 When the bees are in such a state, they feel much more vulnerable and are less likely to attack anyone or anything. Fortunately, Brown’s extraction went off without a hitch, and the only likely harm that took place were the bills customers still had to pay for the lunches they had to abandon once the bees arrived.